Keep your money in the community. For every $100 spent at a local business, $45 stays in Austin, vs. only $13 for every $100 spent at a chain store. That’s money to fix the roads, maintain our parks, and sustain local services! Local business owners are your friends and neighbors. It’s not just a great idea to support your friends and neighbors, it’s a lot more fun! You can stand in line to be checked out by a bored cashier who just wants to get their shift over with and go home, or you can strike up a conversation with someone who is excited to do business with you, to talk about the products you’re there to buy, and build a lasting relationship with a vendor you’ll love to visit for years to come. Quality. Sure, you can get the same commodities everywhere, but locally-made crafts and products made with care will beat assembly-line produced products any day. Don’t get the latest trendy nonsense, stand out from the crowd with something unique, fun, and local! Fun. Have you visited a vintage or thrift store lately, or checked out one of our local icons like Toy Joy or Sue Patrick? 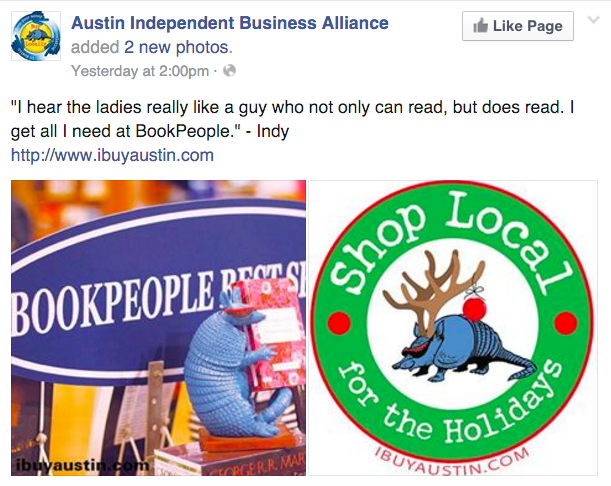 What about Book People or Wheatsville Co-Op? We have such fun, funky shops, there’s just no reason to suffer the hordes at the mall when you could be out actually enjoying yourself instead! Why make shopping a chore when it can be a delight? Convenience. Our IBIZ Districts are clusters of locally-owned businesses all conveniently located so you can easily get everything done without traveling all over the city. Shop, dine, enjoy entertainment, and get the services you need all within handy walking distance. And with 8 to choose from . . . well, why even choose? Visit them all! It just feels good. And isn’t that what the holidays are all about? Sometimes it seems like they’re all about stress and chores and family obligations, but really – they’re about togetherness and celebration and community. So why not extend that to every part of the process, including the shopping part! We’re doing out part to help by letting you know about upcoming events like Small Business Saturday and the IBIZ District Holiday Shop Hop on December 8th, so you can get your shopping done and have a great time doing it, enjoy some entertainment, maybe find some great deals. If you know of other events or tips for keeping our holidays local, share them in the comments!